Noida is an incredible city and a popular part of the National Capital Region that goes through constant development each day. In fact, this city is the fastest developing part of the NCR today. No matter what you are looking for, you will surely find it in Noida. The real estate sector in Noida is booming today with plenty of residential and commercial projects in different parts of the city. ATS Rhapsody is one of the latest residential projects in Noida by ATS Group that is an architectural beauty. 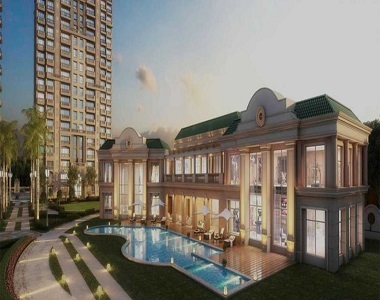 Extended over 6 acres of land, this development contains 7 spectacular towers that offer 3BHK as well as 4BHK deluxe apartments that are designed by Hafeez Contractor. The apartment area sizes start from 1800 sq. ft. and go up to 2400 sq. ft., providing beautiful space that you will fall in love with. ATS Rhapsody Noida Extension is a glorious development that offers supreme luxury and comfort through its range of internal and external amenities. The apartments are high on space and luxury fittings and furnishings, high-quality vitrified/marble flooring, anti-skid flooring in bathrooms and balconies, marble/wooden flooring in bedrooms, veneer flush main doors, skin moulded internal doors, large balconies and aluminium/UPVC/hardwood panel windows providing landscape views, fancy kitchens with pre-polished granite/marble counters, safety features, OBD paint on internal walls and more. ATS Rhapsody Greater Noida West offers marvellous external amenities that include a gymnasium, clubhouse, swimming pool, jogging track, multiple sports facilities and a play-area for your kids, landscape garden, open space, multipurpose hall, efficient car parking, swift lifts, power back-up for emergencies and top-notch security with video surveillance. Situated at Sector 1, Greater Noida West in Noida, ATS Rhapsody Sector 1 does come in close proximity to several landmarks of your everyday and emergency needs. You can find and access places like schools, universities, malls, shopping centres, cafes, restaurants, cinemas, general stores, supermarkets, banks, ATMs, hospitals, medical centres, public transport and a lot more in the shortest amount of time possible. The ATS Rhapsody location map is simple and you can locate this well-endowed development from a distance. Starting at Rs.75.60 lakhs and gradually moving up to Rs.1 Cr., the ATS Rhapsody price list is unbelievable and definitely worth the remarkable features that it has to offer. May it be your new home or an investment, a purchase at this development is one of the best decisions you will ever make! You can conveniently choose from a range of payment plans according to your convenience and also opt for easy home loan at low interest rates, NRI services and more for a convenient purchase without any hassles. Sprawling 2.7 acres (approx.) of central landscape. 5 mins drive from sector – 120, 121, Noida. 10 mins drive from to SaiMandir, sector – 61, Noida.